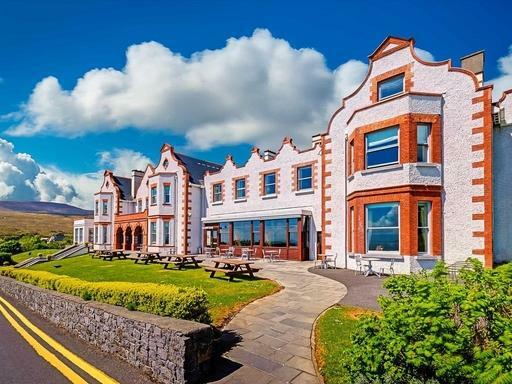 Nested in a magnificent site overlooking Clew Bay with views toward Croagh Patrick Mountain, Great National Mulranny Park Hotel is the ideal West Ireland coastal escape. The Wild Atlantic Way is at the front door and the beautiful Great Western Greenway starts from the back door. The bedrooms all feature beautiful views over the Bay or the surrounding woodlands. For a special stay, Deluxe Rooms are equipped with romantic 4-poster beds. Beatles fans will be thrilled with the John Lennon Suite, the very room shared by John and Yoko during their stay at the hotel in 1968. Nephin Restaurant enjoys spectacular views over the water and mountains, perfectly complementing the fine cuisine sourced from fresh local ingredients. Chef Chamila Manawatta’s signature dish is Clew Bay scallops, artichoke puree, glazed pork belly & veal jús. Once you try it, or indeed any of the dishes, you will understand why he was awarded Best Chef In Mayo from the Irish Restaurant Awards. Another casual option is The Waterfront Bistro and Bar – a great place spot for classic Irish favourites such a chowder and brown bread. Unwinding after a long day’s coastal walk was never more pleasant. Enjoy the 20 metre heated pool in tandem with the outdoor Canadian hot tub, indoor Jacuzzi, sauna, mosaic tiled steam room, plunge pool, spa treatments, gym and fitness classes. Great National Mulranny Park is the only hotel located on the Great Western Greenway – one of Ireland’s great walking trails. Indeed, it’s on the most scenic stretch of the trail, putting you in easy reach of some of the most gorgeous scenery on the Wild Atlantic Way.